What a disappointment, this drama was promising at the beginning. The storyline and its plots sound interesting, but halfway through the show, there are many loopholes and questions left unanswered. Such as what happen to Rui En father, will he be jailed for his crime? How does Rui En Dad know that Jing Hao is the victim family? I refer to the car accident which killed Jing Hao Mum when he was young. There is no indication that he knows and he even plans abduction on Jing Hao father on his daughter wedding day. Furthermore, Who in a right frame of mind would do that on their daughter wedding? Last but not least, what make Xin Jie change her mind about marrying Jing Hao? Wilber Pan is about the only person I can recognize in this drama. After his pervious drama with Raine Yang, he had improved a lot and he deserved to be rewarded for his effort. Basically, he is alright in this drama and his acting is moderate although he may look stiffed in his acting at times and having the same expressions over and over again. But he tried his best to get into the role of Liang Jing Hao and he does it well despite his limited expressions and he does the crying scene pretty well too. The collaboration between Sandrine Pinna and Wilber Pan helps to add some points for his acting. Initially, I was amazed that the leading actress and the supporting actress are newbies. I went online to google about his actress and find out that she actually act in movies in Taiwan and she even won the best actress award in Taipei Flim Festival. Honestly, I had never seen her in any drama before, at least not playing any major role in a drama. I must admit that I was skeptical of this pairing (Wilber pan and Sandrine Pinna). Although I don’t like Rainnie Yang and Wilber Pan pairing, they still appear to be a cute and adorable couple. I am not sure about this pairing though. However, I still gave this drama a chance. The first few episode was not very natural especially Sandrine Pinna expression. However, she gradually improved and showed her potential towards the middle and at the later part of the drama. Despite that, she ought to be encouraged as this is her first leading role in an idol drama. She is natural and creative in her acting, unlike some actresses who can only show the same expressions angry, sad or happy. I will give 3.5 stars out of 5 for this drama. 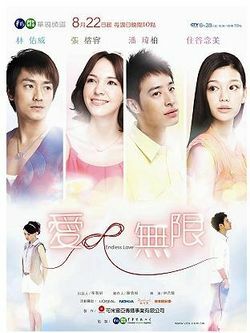 The only thing I enjoyed the most is the chemistry between Sandrine Pinna and Wilber Pan. The acting of all the cast were moderately good too. Last but not least, I think this drama should be called – the torture of Song Rui En. Because she was hurt and ‘betrayed’ by her close ones – her father and Jing Hao. Many times, the scene was shoot in the hospital which was boring. Anyway, I am glad that the ending is nice, however, I feel that the director should add another series about continuation of Jing Hao and Rui En life after marriage. I think that will be sweet because the script writer makes her character so pitiful and gave her so much heartache.